www.guitaratthe priory.com This course offers instruction on playing and understanding the various musical styles of Latin Jazz on the finger-style guitar. A residential guitar course, by its nature, facilitates concentrated study and the sharing of ideas and skills with other players both amateur and professional. There is an opportunity to enjoy new and familiar repertoire in solo, duo and ensemble groups. John Zaradin, Eric Hill, Olé Halen, Janne Lehtinen and Leslee Booth are all experienced, live performing and recording musicians who undertake to explain and demonstrate the techniques needed for playing, arranging and improvising music in Latin Jazz styles on the guitar. 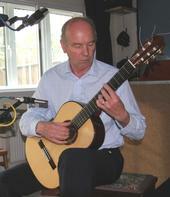 www.deparystrio.co.uk The De Parys Trio consists of Martin Hughes, Violin, Jill Hughes, Flute, together with Eric's guitar. This combination of instruments provides opportunities for a wonderfully eclectic repertoire and hugely enjoyable concerts. www.nbgc.org.uk The website of the North Bucks Guitar Club. The club meets monthly to play ensemble music plus members solos, duets etc. Eric Hill is a musical director of the club. www.fishman.com Eric uses a Fishman Loudbox amplifier + microphone to provide very high quality characteristically acoustic sound reinforcement in the De Parys Trio setting. He also uses a Fishman Aura Acoustic Blender for situations requiring higher volume. www.musicpad.co.uk Eric uses this digital sheet music technology which allows pages to be "turned" silently using a foot pedal.